Learning to read music can be FUN! 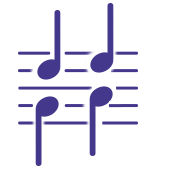 That is the goal of FUNdamental Music Mastery™: to enable K through 5th grade students to experience the joy of reading music, as they learn music fundamentals with confidence and independence. FUNdamental Music Mastery helps students master challenges in short packages that encourage them, and lead them to discover and MASTER specific and necessary skills. The course trains the learner with drill. Correct, creative drill leads to Mastery. FMM trains the learner to recognize patterns and intervals before they sing or play. This is how we learn to read: first by hearing sounds and linking them to symbols; next, connecting those symbols to words; then, connecting the words into sentences that have meaning; and finally, using our vocal inflection to convey that meaning with expression and emotion. A complete K-5 music sight-reading course.